Sorry to hear this again NZ members. LeroyC, for one, would be close to it. I was listening to the news on that last night, it was the Tsunami threat that was the spookiest as the whole east coast was a possible threat. Luckily it didn't eventuate at the 5 meter levels they thought possible. Yeah. Really feel sorry for the people in and around Christchurch. They no sooner rebuild and it gets wrecked again. It was felt in the north island as well. There are photos of shops with smashed windows (from the quake) in Wellington. This is a big quake - it might have been 2 quakes. Feeling it for the NZers that have been effected, especially for the second time around. Super moons and earthquakes have some correlation due to gravitational pulls I read somewhere. Lets hope there is not another repeat. Best wishes Kiwis. Yeah, Im up here in Napier in the north island and that was the biggest one I've felt. Where I am in Christchurch it had some good rolling action for a few minutes, enough to get the heart pumping and rekindle memories of the last one. Really feel for the people further north who will have a long journey ahead to recover, and months worth of aftershocks and sleepless nights. Yep it was quite long, long enough to start thinking what's going to happen next. My heart goes out to those affected from it and to the families that have lost loved ones. Hey folks. I've had a couple of messages from members to see if I'm ok so thought I'd just post here to confirm that my family, our house, our area and my work (Christchurch Airport) are all ok. It wasn't much fun and was definitely the worst since the 2010/2011 quakes. We live in Woodend in North Canterbury which is only 80km or so from the epicenter. It seems we felt it worse than most people in the Christchurch area, but the energy looks to actually have travelled more in a northerly direction and the worst damage is between the epicenter and Wellington. Some people said that Trump being voted in would send shock waves round the world. I didn't think the meant literally!! Got a family trip to hanmer springs in a few months, looks like that was the epicenter. Terrible news for those over there, can't seem to catch a break. I'm flying into Christchurch on Friday morning and supposed to be driving up to Kaikoura. I've seen online that the highway is closed heading up there, is there still access via the back roads or is it impassable? Yes the big one was centered about 20-25km ESE of Hanmer. I'm not sure but it sounds like Hanmer has suffered less damage than nearby settlements like Mt Lyford and Waiau as well as the Kaikoura coast. It will take a few weeks to do enough remedial work to open the main coast road again (State Hwy 1). There is one inland road, but it goes straight through where the epicenter was so I'm guessing it's not much good either. Plus it meets the coast to the south of Kaikoura so doesn't quite get all the way there anyway. They'll be working very hard to get things open again, but I think the focus will be on freight line alternatives via Nelson. I doubt it'll be open on Friday sorry. Those pictures are nuts Leroy! Never had the "luck" of feeling a quake. Slept through a couple of little shudders as a kid and a couple of years ago we landed in LAX to stone white faces, the TSA lady said "lucky your plane didn't land 10 minutes ago, that was a big one" and from memory it was low 6's but didn't stop planes from landing or the airport from running like normal. I used to live in chch in the early 90s and we had a few come through. One time we were in the basement of am old building in town, by the time we had figured out what was happening it was over but a bigger quake could have been a real problem for us. I've seen them in chch where the fields are rolling, like waves, weird. Guy I used to work with in the Bay of Plenty would look out his office window and say "looks like earthquake weather" and sure enough we would get one, nothing big luckily. The main road (State Hwy 1) will be closed for at least a few weeks. 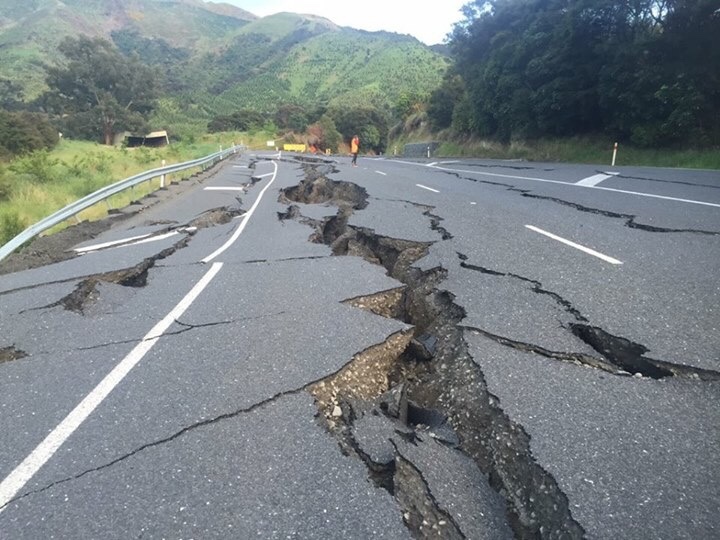 The inland road from Chch via Waiau might be open by Saturday, but Kaikoura itself won't be open for business as such so if you're going for a holiday then I'd say it's all off sorry. It could be months before Kaikoura can handle much in the way of tourism again and the recovery and rebuild will take years. Are the aftershocks affecting you there LeroyC? Thanks for the update Leroy. Yes it's only for a family holiday, had booked in a few nights in Kaikoura to check out the area and go whale watching etc. Planning on staying well away from the effected areas now, I'm sure nosey tourists is the last thing locals/authorities want to be dealing with. Once we land in Christchurch might just make our way over to Queenstown instead. Yeah that's probably a good idea. It's really just Kaikoura and the surrounding area that's out of action, the rest of the Sth Island is good to go. Maybe not. The seabed has been raised 2m in some locations. Race is on to save paua (abalone for you aussies) that have been left exposed. That's made the news. Save the paua! Best wishes to all our NZ brethren affected by the EQ. Any more aftershocks there, LeroyC?